What's included in your Mauritius holiday package at Beachcomber Victoria for Two? This quote is based on an Air Mauritius Travel Smart Program subject class airline availability at time of booking. We are pleased to announce that Beachcomber Victoria now offers an adults-only option with its new 'Victoria for Two' wing. This new adults-only area with its own bar, pool with swim-up rooms, secluded beach and Steak House restaurant is separate from the main Victoria property. The Victoria For Two is an adults-only wing, opened on 01 December. It forms a part of the 4* Superior Victoria Resort & Spa. With 40 rooms, its own à la carte restaurant, bar and an 800 m² swimming pool, the Victoria For Two is the perfect accommodation for those seeking peace, quiet and exclusivity. Designed with couples in mind, the new wing ensures tranquillity for couples on honeymoon, renewing their vows or just simply enjoying a romantic break. Spacious, double occupancy terraced rooms of 50 m² overlook the ocean and lead to a secluded stretch of beach edging the Balaclava Marine Park. There are two room categories - 23 Ocean View Rooms, and 17 novel Swim-Up rooms with direct access to the wing’s swimming pool. 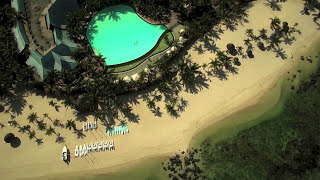 The Swim-up room is a new concept for Mauritius! Take a dip straight off your balcony into the pool. Now there is nothing stopping you from swimming from your room to the bar to order a beverage or snack! Holidaymakers booking accommodation in the new wing on the Beachcomber All-Inclusive package can also enjoy interchangeable restaurant options and experience different resort atmospheres at the nearby Canonnier Beachcomber and Mauricia Beachcomber properties. Why Choose Victoria For Two? Victoria for Two is an adults only section of the Victora resort - no children are allowed in this area of the resort. All rooms are sea-facing and open onto the pristine beach. An artists impersonation of the Swim-Up room at Victoria for Two, a first in Mauritius! The swim-up room has direct access to an 800m2 swimming pool. The adults-only restaurant is described as an “Elegant barefoot” dress code and offers breakfast and steakhouse-style dinners, paired with outstanding views. Open daily for breakfast and dinner, “à la carte”. Swim from your room straight to Nautil Café and enjoy a wide range of drinks and snacks. The poolside bar serves drinks and snacks from mid-morning until late. This is the main restaurant of Victoria and divided into separate sections for a more intimate atmosphere. Live cooking is a big attraction at Le Superbe, which, as the name suggests, results in superb local and international cuisine. Autour du Monde (Tour of the World) perfectly describes the global selection of food on offer here. Tables are arranged to create a romantic pool and beachside ambience. Buffet dinners are included for half-board guests. Packages are purchased up to 30-60 days in advance and rates apply to all adults and children travelling together for the entire stay. Packages are operational from arrival to departure, regardless of check-in/check-out times. Inclusions may vary by resort, so check the availability of the optional inclusions in order to get full value for money.